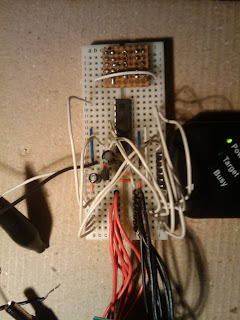 Mindfront Technologies blog site for Microcontroller circuits and other electronics projects. Wintek WD-C2401P LCD panel is a 24x1 character display. 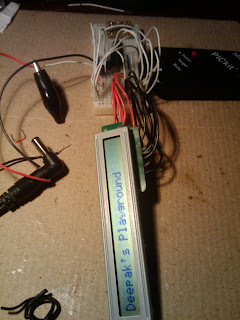 The code for using the LCD was written for microchip PIC 16F88 but should work with all other micro controllers. 3 Reset When this pin is low it resets the LCD. You can either tie this pin to a pin on your microcontroller so you can reset the LCD before initializtion, or just tie it high. I had a couple of times where I couldn't init the LCD without first resetting it, so I'd recommend putting it under micro control, or some other powerup controller. The reset low time should be at least 10ms. The time after reset before you start commanding the LCD should also be at least 10 ms.
5 Read/Write Set this pin high to read from the display. Set this pin low to write to it. If you don't need to update the display super fast you can save an I/O line by just tying it to ground. Wait at least a millisecond between each command and data, though, since you can't query the busy status without read capability. 6 E Enable. This line works to clock in data and commands. See the protocol section below. //actually two 12-character lines right next to each other). // and designate the pins properly in the include file. Poorly presented. The content is also very disorganized with a lot of computer based language populating the middle of the page. It is also not appealing to a broader audience. If this was supposed to be a dissertation then yes, it is a very poor one. It lacks a lot of information. If it is supposed to help someone use the display then I believe it is very good. It has the information needed and it doesn't include a lot of rambling words, I like it. Automated scoring of writing shows serious flaws with fixed rules and no understanding of the context or subject matter. Or if this critique of the writing style is by a human, it shows an even greater failure. This conveyed almost all information one would ever need to use one of these displays. The only missing bit is how to generate and use user generated character sets. Since the data sheet on this part is a little hard to access, and also a bit hard to understand this brief explanation serves a real purpose and does it well.